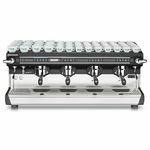 At Coffee Quest we work closely with some of the worlds leading coffee equipment manufacturers to bring to you a superb collection of espresso coffee machines. From 1 group machines suitable for small outlets - or even home use - via the most popular 2 group coffee machines, which come in a variety of guises from compact to tall models for takeaway cups, through to 3 or even 4 group behemoth machines capable of extracting perfect espresso shots all day - every day. All installations are carried out by our own factory trained engineers using Brita Purity professional water filters. We also offer a comprehensive barista training program to ensure you get the best out of your equipment. Any of the equipment we offer can be purchased outright. However, if you'd like to look at leasing your equipment, over a set period of between 12 months and 5 years, then just ask and we'll introduce you to the friendly team at our finance brokers, C F Capital plc.